This incredibly versatile Italian sauce is piquant and salty. It's traditionally paired with boiled meats but its green, garlicky, tangy flavour makes it an ideal accompaniment to roasted vegetables, cheeses, and any kind of fish or shellfish. Alter the ingredients to suit your taste and your store cupboard, leaving out the anchovies if you want it to be vegetarian. Strip the leaves from the herbs and put in a food processor with all the other ingredients, apart from the pepper and sugar. Blitz to a coarse sauce - don't make it too smooth. Alternatively, chop the dry ingredients by hand before mixing with the oil and vinegar, to give a lovely, chunky texture. Season with pepper and sugar (you shouldn't need salt because of the olives, anchovies and capers). Use immediately. Bouquet garni - Thyme, parsley stalks and bay, traditionally wrapped in a muslin sack. You can also add celery leaves. Use to infuse a deep, savoury flavour into stocks and stews. 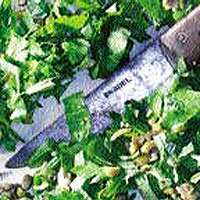 Fines herbes - Chives, parsley, tarragon and chervil, often used in omelettes. If you can't get chervil, leave it out. Herbes de Provence - This varies but usually includes rosemary, thyme, oregano, basil, bay, and marjoram. Use in tomato, garlic and olive based Provençal dishes.